Round trip transportation on deluxe highway motor coach equipped with a bathroom. Guided tour of the Butterfly Conservatory. Buffet lunch in the Paradise Garden Cafe. 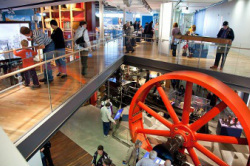 Admission to the new Waterloo Region Museum. A private presentation at the museum for our group titled "Edwardian Edibles". We will be delving into fascinating kitchen gadgets and examining the food and unique recipes in use at the turn of the last century aka around 1900! And oh yeah, we will also be trying some scrumptous samples of food and drink from that era. A visit to the quaint township of Wilmot. English Afternoon Tea with the world's best scones, clotted cream, locally made preserves, pastries, cakes and mini desserts. And we will be enjoying our tea in a converted and renovated 1887 building that is a beautiful example of Victorian mercantile architecture. $119 per person all taxes and tips included. It's February and it's cold outside so what could be better than visiting a tropical paradise and having lunch surrounded by butterflies and waterfalls and lush tropical rain forest? Join us on a very interesting, informative and jam-packed day trip to the Tri-City area (Cambridge, Kitchener & Waterloo). As usual, our day is filled with lots of stuff to see and do and lots to eat! Have you heard of the TV Show "Downton Abbey"? That was set in the Edwardian era and as you know, much time in that era seems to be centered around the kitchen. So our very first activity today will be a one hour private presentation for our group titled "Edwardian Edibles" which will delve into the fascinating kitchen gadgetry, food history and unique recipes in use in this area during the Edwardian era . As part of this presentation, we will get to sample some foods and drinks of that era, made as they would have been back in 1900. After the presentation we will wander the museum and check out the exhibits which include 12,000 years of the history of Southern Ontario, the "Coming Of Age" exhibit which explores the experiences of our teenage years, the Hmong exhibit which examines the Hmong tribes of Laos, Vietnam, Thailand and China; and the Museum also houses the Waterloo Region Hall of Fame. After our visit to the Waterloo Region Museum, we travel to the Cambridge Butterfly Conservatory. Upon arrival at the Conservatory we will start off with a delicious buffet lunch in the Paradise Garden Cafe at the Conservatory. Lunch will include assorted soups, salad bar, deli sandwiches, quiche and dessert squares. Tea, coffee and various fruit juices included. After our lunch, we will enter a lush tropical garden and walk amongst thousands of freely flying butterflies! 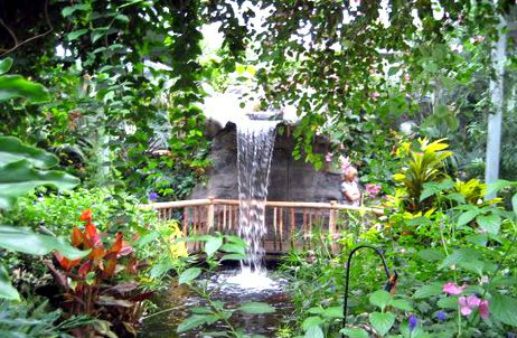 The conservatory features over 2,000 free-flying tropical butterflies and moths. At the Emergence Window, you can watch as butterflies emerge from their chrysalides, dry their wings and prepare for their very first flight into the Conservatory. Some butterfly species are reared onsite so that you can observe all four of the stages of metamorphosis: egg, caterpillar, pupa, and butterfly. In addition to butterflies, the Conservatory also features many species of tropical birds and bugs, and hundreds of tropical plants. We now travel to the lovely little township of Wilmot and the quaint village of New Dundee. You are going to walk through the circa 1887 front door of this classsically Victorian building to be greeted by the gentle chime of the same bell that has announced customers for 126 continuous years. 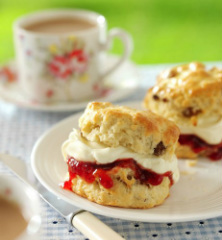 We will settle into our seats at our private tables for a traditional English afternoon tea service consisting of tea or coffee with world famous scones, devon cream, locally made preserves and a delectable selection of pastries and cakes including minature spiced cakes, shortbread cookies and an assortment of other sweets. Yum!